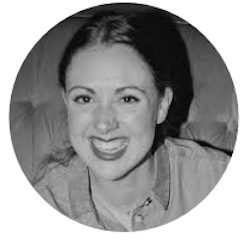 The lovely Hester Lear, owner of online personalised gift and décor boutique Wedding in a Teacup is back with her tips on throwing the perfect hen party. There’s so many options these days and let’s face it, quite a bit of pressure so I’m glad Hester’s on hand with some expert advice. Hen Dos have evolved; they’re now as varied as the weddings they anticipate. They range from ‘going wild in a bar with bunny ears’ to harmonious sewing bee where a quilt is crafted for the bride to treasure. In today’s far-flung world, it can be less about getting all your local mates together for a bash and more about introducing varied friends, colleagues and family to one another, maybe for the first time. This has the undeniably huge advantage of forming a fabulous female bond before the big day itself. If your mum’s coming, include your groom’s mum and his sisters too! The warmth that you can create at a great hen do is priceless. 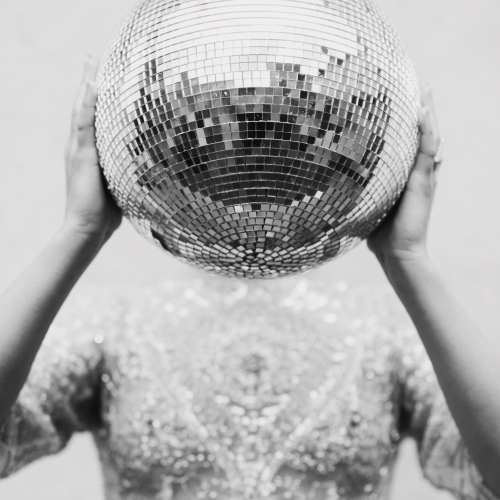 In our experience what really divides a good hen do from the bad is the intimacy, the bond between your best girls and of course all those special personal touches that really make a hen do sing! 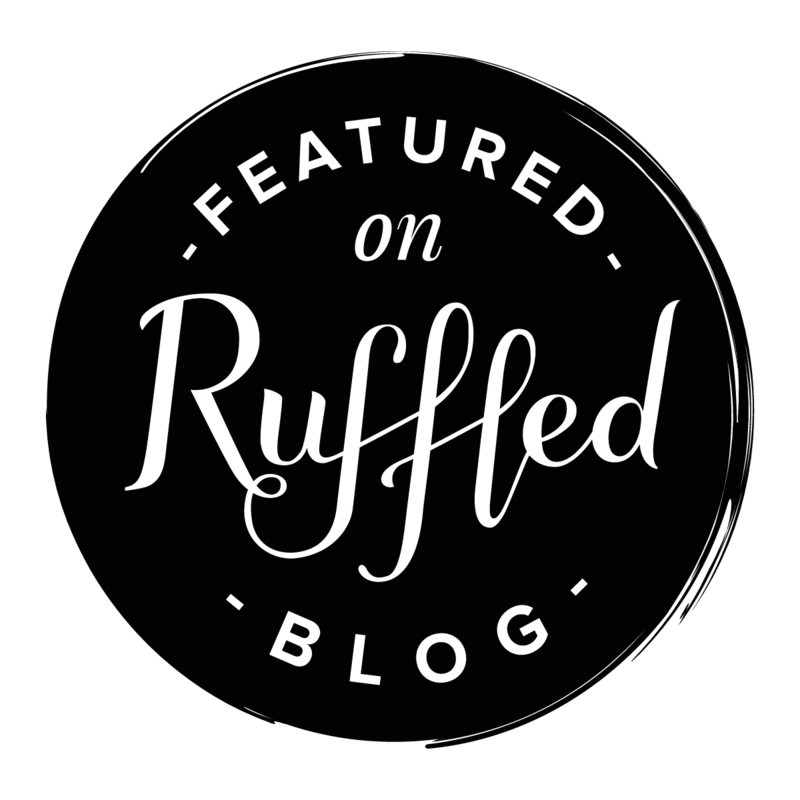 If you are planning your own hen do then read on or pass this onto your bridesmaids so they can get planning you the perfect send off to start life as a Mrs! 1. The Invitations: These flag up that your hen is a special event from the start. Send badge invitations personalised with the date of the do and each guest’s name – to be worn on the day itself as great ice breakers! Or our sunflower seed packets are perfect for a nature loving bride, and a country weekend. Sparkly pink OMG notelets will ramp up the excitement …. 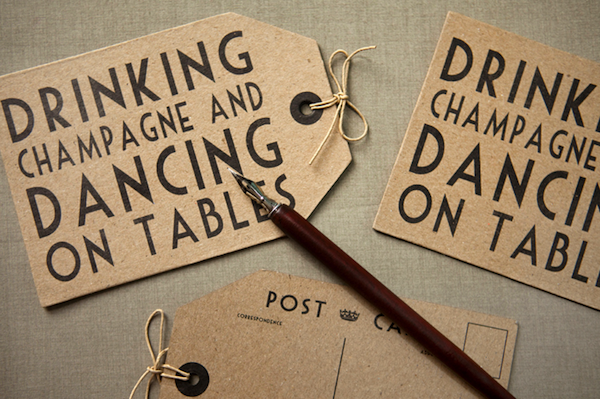 and our ‘time to drink champagne’ stamp on the back of the envelopes sends a great message too! 2. 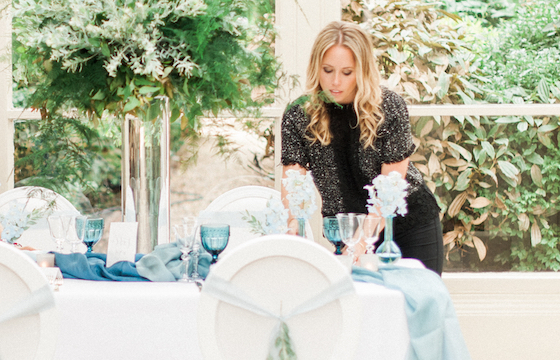 The Decorations: The humblest setting can be transformed with a bit of thought and pizazz! 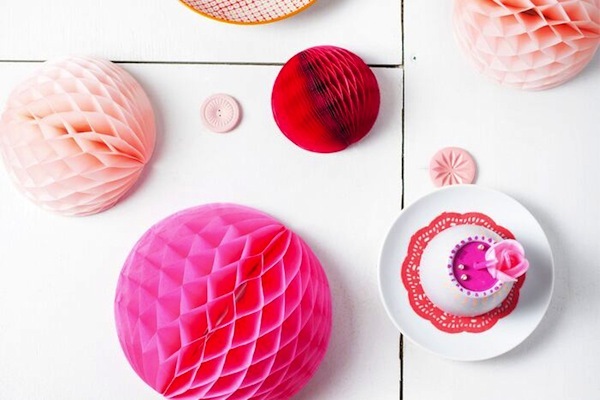 Scatter bright confetti on the tables, pop fun paper straws and retro charms in the drinks and string bunting and colourful pom-poms from the walls. Top it all off with a ‘hen party in process’ sign to make sure you’re not disturbed. 3. The Pressies: Gifts for all the girls are a really thoughtful touch, and can be practical too. 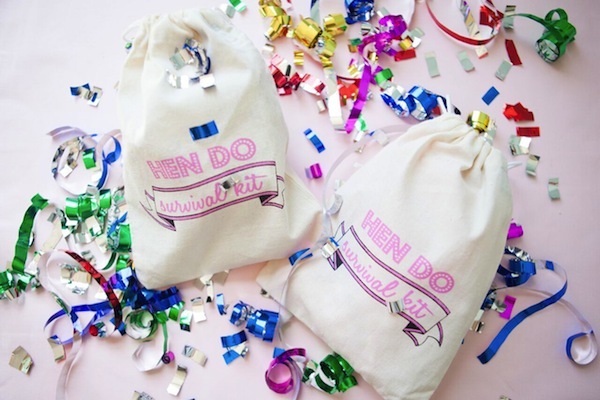 Fill hen do survival kit pouches with goodies to keep everyone fizzing: sweets, plasters, paracetamol, mini bottles of booze and detox face masks – they’ll thank you for it later! Pin one of our matching big badges to the front personalised with the guest and bride to be’s name for instant introductions – great to wear to the bar. 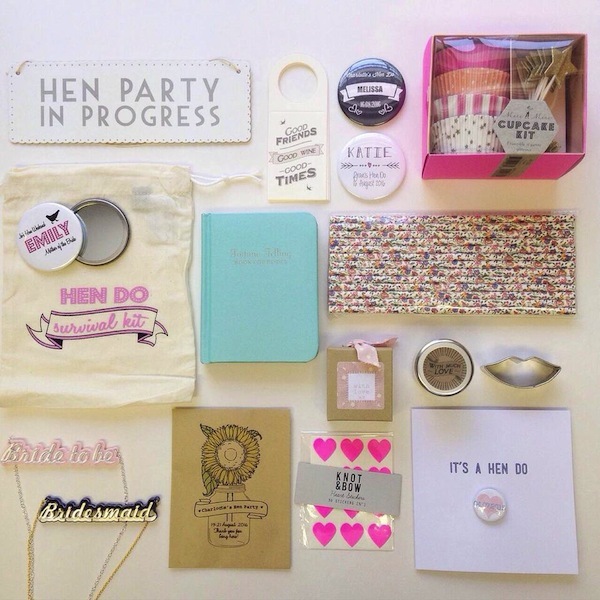 Don’t forget the bride-to-be herself – this is (hopefully) the only hen do she’ll have – so spoil her rotten! You can cram lots of goodies in our ‘bride to be’ tote bags and they not only make a lovely keepsake, they’re a great sash alternative for the girl with classy tastes. 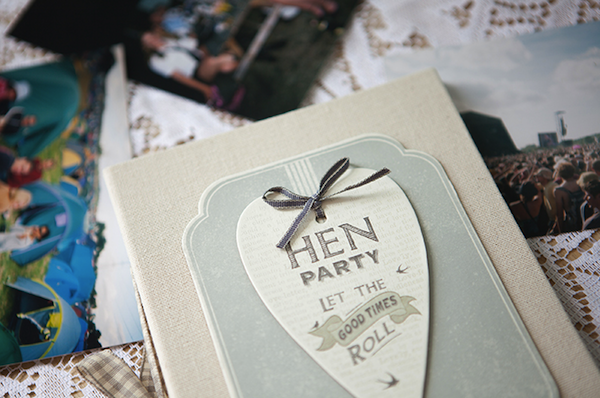 Fill the bag with gifts that she can use on the hen and keep for her wedding day too. We love the fortune telling book for brides – a fun conversation focus for the whole group! 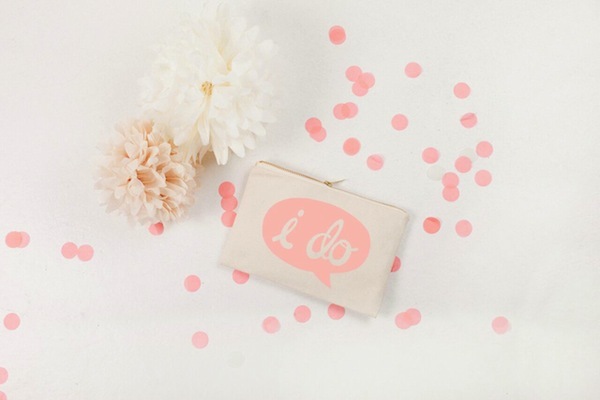 Pop in a pocket mirror personalised with her name and the date – she can use it on her wedding day and smile as she remembers all the support she has around her. And pride of place – a stylish, handmade bride to be necklace that she can wear to stunning effect the whole hen weekend. 4. The Keepsakes: A ‘fill me in’ poster and some colourful pens gets the warm fun rolling; everyone can write their message and memories on it throughout the hen do and it makes a wonderful keepsake for the bride. Or create a hen-do guest book for her by filling a photograph album with all the chicks’ childhood photos and memories of her (a great conversation starter too); add to it throughout the day and gift it to her at the end, leaving a few blank pages for her to finish off with memories of the best hen do ever!